Here are some things I’ve learned by being curious. It is ok to not have a singular passion. Every piece of advice I’ve been given my entire education and career went something like this: “Find your passion. Make it your purpose.” The implication is pretty clear — pick one thing, do it really well to the exclusion of everything else, and that is the recipe for success. But from an early age, that didn’t sit well with me. In college, I was premed and picked a multidisciplinary major (biomedical ethics) which was a blend of biology, religious studies, comparative literature and philosophy. And once I graduated from college, I found myself wanting to try everything — I wanted to be a lawyer, and a designer. I wanted to try my hand at cooking, and also work at a non profit. I wanted to work in tech and startups, but also explore my interest in media. I wanted to write a book, but also pursue public speaking. And after years of worrying I was bouncing from one thing to another, I realized that I was multi passionate. I realized that success didn’t need to be defined by a straight career path. It was ok for me to follow my curiosity and have multiple passions. You may not get a lightning bolt – it might just be a gentle tap on the shoulder. In Elizabeth Gilbert’s book Big Magic, she describes curiosity as being a tap on the shoulder and encourages you to turn gently toward it and investigate. I love this idea. Curiosity isn’t necessarily going to grab you by the shoulders and shake you to get your attention. It might be more subtle than that. So pay attention to the things that invite you, sometimes subtly, to turn towards them and take some notice. And then take a step or two in that direction and see what happens from there. It’s ok to not have a plan — or an end goal. I am of the firm belief that curiosity builds empathy. When I was working on my first book, Stalking God: My Unorthodox Search for Something to Believe In, a memoir about my attempt to find answers to questions I can’t simply Google an answer to for my young daughter (think Mindy Kaling meets Eat Pray Love), I traveled the world and met people with a broad range of experiences and perspectives. I found myself deeply and genuinely curious to understand the minds of others who are in radically different (and radically distant) circumstances, and with (in some cases) radically different beliefs. Empathy is a powerful force, but it’s even more powerful when you find yourself feeling it in connection with a perspective that’s opposed to your own natural perspective. And for me, my deep curiosity about people and their beliefs built connection. I am surrounded by successful entrepreneurs in my work. And one of the things that made each of them so successful was their singular drive. They had one question they felt they had to answer — for example, at Warby Parker, it was the founders’ curiosity around the question: Why do glasses cost so much? Their own curiosity around answering that question led to a wildly successful business that I loved being a part of building in its early critical years. But for me, I haven’t found one singular question that drives me. Instead, I am equally curious about lots of questions that come across my desk. And my willingness to jump into the unknown, to be comfortable with digging into new questions and ideas and come up with innovative solutions, my curiosity — that is my superpower. In fact, someone at TED once referred to me as an “idea acupuncturist” because I love to dig into any idea and see how I can help the energy of that idea flow even better — and the term stuck. And now, supporting others in exploring the answers to the questions they come up with, and executing on those answers, has become my business — you might say I am a full time idea acupuncturist! I recently co-founded a company called The Justice Dept. where we support founders and creatives (with a focus on women and a few woke men) in executing on their passions. I’ve finally recognized that my genuine curiosity about a wide range of areas and ability to make connections across disparate ideas, industries, people, etc., is actually my superpower. Curiosity will take you to unexpected (and really interesting) places. My curiosity has led me to meet some of the most interesting people in some of the most incredible places. From sessions with gurus and shamans across the world over the years I spent researching my book, to advising world leaders like Malala Yousafzai and Megan Smith (former Chief Technology Officer of the United States under President Obama), to taking the TED stage, to marching with clowns in the Macy’s Thanksgiving Day parade in NYC (yes, I really did that), my curiosity and willingness to be uncomfortable has placed me in some of the most extraordinary places with even more extraordinary people. But there is nothing special or unique about me that led me down this wonderful road. I just kept turning my head in response to the gentle tap of curiosity on my shoulder. I hope you do too. 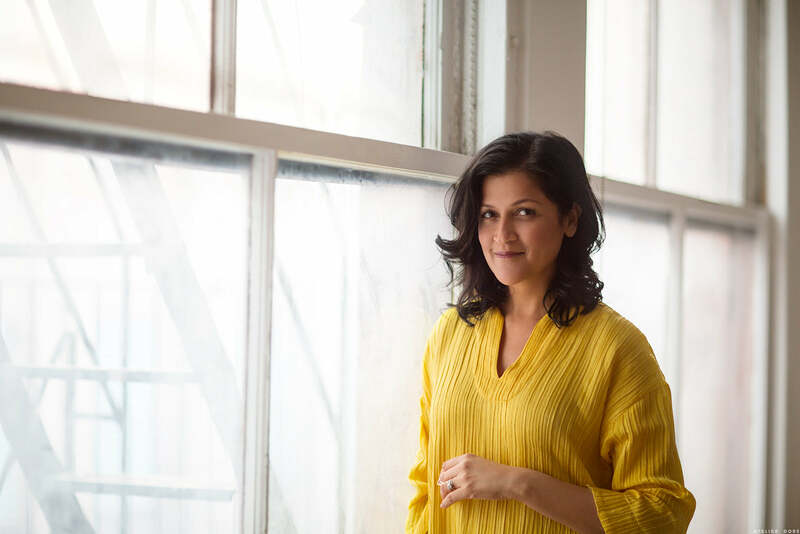 __________Anjali Kumar is a Brooklyn born, first generation Indian American author, attorney, advisor, speaker, and “idea acupuncturist”. She is the co-founder of The Justice Dept., an advisory and legal firm that works with women entrepreneurs, executives, talent, brands and creatives in all stages of their careers and businesses in the areas of technology, consumer products, media, entertainment and fashion. Prior to co-founding The Justice Dept., Anjali held C-level positions at several startups in NYC, including Google and Warby Parker. Her first book, Stalking God; My Unorthodox Search For Something To Believe In, was published in 2017. So refreshing to finally read that “passions” can be simple acts of curiousness that make you happy, instead of a single huge “Eureka!” that should define you. “Inspirational” gets tossed around alot (I must have said or typed it a few times already this week”, but this interview deserves that adjective. I identified with her and was struck by how thoughtfully she expressed herself. Having several passions, or rather, different subjects of interest over the years or simultaneously is a way to express our freedom. This goes against the too common idea of being pre-determined, pre-defined or defined once and for all (I am talking about those “I don’t like this or that”, “I am like this and not like that and I won’t change” etc). You have the right to change, evolve and like/become whatever you want.